Understanding and appreciating the ethical dilemmas associated with business is an important dimension of marketing strategy. Increasingly, matters of corporate social responsibility are part of marketing's domain. Ethics in Marketing contains 20 cases that deal with a variety of ethical issues such as questionable selling practices, exploitative advertising, counterfeiting, product safety, apparent bribery and channel conflict that companies face across the world. A hallmark of this book is its international dimension along with high-profile case studies that represent situations in European, North American, Chinese, Indian and South American companies. Well known multinationals like Coca Cola, Facebook, VISA and Zara are featured. This second edition of Ethics in Marketing has been thoroughly updated and includes new international cases from globally recognized organizations on gift giving, sustainability, retail practices, multiculturalism, sweat shop labor and sports sponsorship. 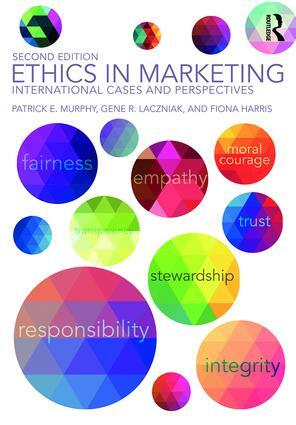 This unique case-book provides students with a global perspective on ethics in marketing and can be used in a free standing course on marketing ethics or marketing and society or it can be used as a supplement for other marketing classes. Discount Drugstore: no gifts allowed?